For years we’ve been making phone calls with sub-quality audio. We’ve done so, because it’s the only option we’ve had. Arguably, some phones have had better clarity than others due to stronger reception, or a better earpiece. But, a key change had to be made, and it’s happening now. PC Mag‘s Eugene Kim performed some standard testing on both music and speaking quality. I’ve only embedded one comparison here, so be sure to check out the full report over at the original source. The clearest difference was heard in the music playback test. With HD Voice you could actually here the music, while standard call connection was downright awful. 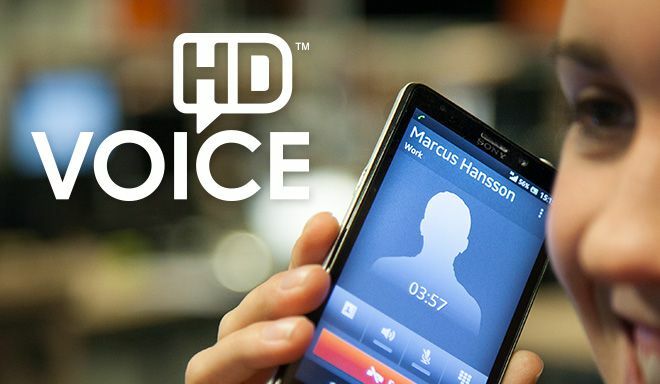 As you can hear, HD Voice doesn’t necessarily mean calling is going to be perfectly clear. It’s still not the best audio quality. But it’s clearly an improvement. What are your experiences using the technology? Have you noticed any major improvements? HD Voice for me was a “holy crap” moment (in an obviously positive way) when I made my first call with it. Most of my calls are now done on HD Voice, so it’s not that exciting anymore. It does sound good. What I don’t get is why both ends need to be HD voice? If one end terminates on the PSTN, the quality of that connection is FAR BETTER than the mobile network. Even those calls would get the benefit of the higher quality audio. As far as I know, it’s handled by the codec which will require matched capabilities to be able to complete the decoding. My experience with HD Voice is hit and miss. Sometimes it works, more than often it does not. On top of this, I get no better sound quality on TMo than I did years ago on Sprint. In fact, TMo no longer sounds as airy sure, but by far more compressed, as if I was speaking using a Nokia device. Compressed, almost too bassy and with a lot of blippy artifacts. I thought we already had this on phones like the Note 2 and Nexus 5…? Oh ok yeah I get it you’re just letting us know…ok. Well yeah in my personal experience the sound is MUCH better. Sounds like the person is standing right next to you. One of the first things I noticed when my wife and family went into TMobile was the HD voice. In areas where it is noisy, it really comes handy. Yes, you can definitely hear the difference in call quality and I’m referring to HD voice on 4G network not VoLTE. Anyone That Lives In The East Texas Area. LTE In Lufkin/Nacogdoches Is Live! was that a 2g only site? Yeah, Last Year Was In 2G, But In The Beginning of the year 4G Was Lit Up. Until Today LTE Went Live. I Did A Speed Test & This Are The Results: 42 Mbps Download And 22 Mbps Upload. Blue is also launching their VoLTE this year as publicized around May 15th, and should have started work on May 23rd. I believe Magenta stated their intent earlier than Blue. I can’t listen to the quality at work but I know the update has been sent out. I look forward to hearing it. Now I’ll just have to find a pretty lady with a silky voice that has the HD calling on their phone and in their area. I was pointing out the fact that AT&T is also moving that direction but that T-Mobile announced it earlier this year. It is relevent to the conversation since AT&T’s standard call sound. The same codec used by T-Mobile for HD Voice over UMTS is the same codec used for HD Voice over LTE (for VoLTE). T-Mobile wins again since they’ve got both layers (LTE and UMTS) covered by HD Voice. HD voice is truly awesome…I can actually understand the other person! But comparing standard AT&T calls to T-Mo HD voice when AT&T has HD voice? Why would you do that? You would need to be a buffoon to think they are comparing networks, obviously it’s apples to oranges and they aren’t hiding the fact. The big take away was comparing HD vs SD. Don’t get all too concerned with which network. You are missing the forrest for the trees by doing so. Right. I’m not sticking up for AT&T, I don’t like them. But I feel like they just take any opportunity they can to bash AT&T. I guess it makes more sense than comparing it to their own network and making their own call quality look bad. Duh… And if you read the source article you would realize the practical reason behind their methods. Assume from now on that Cam and TMO news just recycles news from other sources. For example Cam reported about some random fire in San Gabriel, CA and he probably did so because he probably got a google alert mentioning T-Mobile, so he decided to “report” it on TMO news. There was no follow up reporting cause which you think would make sense to report if the original news was relevant enough to report originally. Very little original content comes from TMO news these days. I’m guessing it’s not a high priority. Dave was a little more proactive on this front. Can’t complain too much though, because at least Cam is curating a T-Mobile google alerts feed for us. I’d hate to do that. Yeah, I like Cam. He may not be as into T-Mobile as David was, but he’s still a good admin. I’m certain that timing has an awful lot to do with it. David spent several years on the TM beat and will have established a substantial list of sources in that time. Given the circumstances of his departure from PhoneDog, it’s fair to assume that he won’t have handed that contact list over for the benefit of his successor. In addition, TM have been getting their act together in terms of controlling the media image of the company. That will doubtless have involved getting much tighter about the leaked release of information from internal documents. As a result, who’s to say that David would have been able to do as well as he used to in terms of getting scoops from such sources? Anyone know if all of T-Mobiles handsets have HD voice or only the premium models? If it’s a codec I’m wondering if there are licensing fee’s that prevent OEMs from including it mid-tier phones. All LTE supported devices can use HD voice on T-Mo. I’m not sure thats true. I’m pretty sure my Nexus 5 doesn’t support HD voice on TMO. I’m pretty sure mine does. I can tell a huge difference when I call someone on Tmo and when I call someone on a different carrier. I read on a support forum that said Googe may not have implemented that on that particular handset so your phone might be the exception. I know there was a big difference switching from verizon to t-mobile. Yes of course for years! Since the day I had T-MOBILE’S HTC Touch Pro 2! Approximately 2009 that’s when I got HD Voice, first thing that happened was I got a notice from T-MOBILE, I thought, hey I know I paid my bill, then I look closely, “congratulations your area has HD Voice”! Not by text, but rather by something called visual voicemail it spoke to me! It guided me step by step, I fell in love instantly like cup of Roman noodles in microwave! Never have I heard such clear voice in my life! Are you kidding me? Are you and Hanna the same person or are you two simply plants posting talking points? You posted the same text in the same thread for the same story? If you people are going to troll the blogs you should at least communicate with each other and use different scripts. Dumbass. Nope not same people, But the text that’s above is missing a lot of information and was alternated! Just fyi I am disabled carefully what you say TMOTECH! Consider this a fair warning. Pretty darn impressive…you know, since HDVoice didn’t roll out until early 2013, what else in life have you received 4 years in advance of it being released? I got a notice from T-MOBILE, I thought, hey I know I paid my bill, then I look closely, “congratulations your area has HD Voice”! Not by text, but rather by something called visual voicemail it spoke to me! It guided me step by step, I fell in love instantly like cup of Roman noodles in microwave! The first time I heard HD voice I honestly thought something was wrong with the phone. It sounded like the person was in the room with me. It definitely makes a huge difference. Wow, there’s a lot of questionable info being passed around about HDVoice. T-Mobile launched their HDVoice capability nationally in January 2013. It’s available via their HSPA network on a variety of handsets. Except for Seattle, where they just launched VoLTE in the past week, all voice traffic on T-Mobile goes over the HSPA network. Even LTE capable phones on the T-Mobile network switch to HSPA to make voice calls. AT&T opted to wait until launching VoLTE to allow HDVoice. Both AT&T and T-Mobile are using the W-AMR codec which is a 3GPP standard for wideband voice. Presuming that Verizon also waits until moving to VoLTE before allowing HDVoice they too will use W-AMR. Sprint, even the outlier, has opted to deploy the EVRC-NW codec on their CDMA network as a means of offering HDVoice nationally before they have nation-wide VoLTE capability. T-Mobile has made it quite difficult to determine which handset they offer include HDVoice support. The handset itself may support HDVoice, as there are according to GSA 329 HDVoice-capable models, but the carrier may not allow W-AMR use in any particular model. For example, the Nexus 4 is HDVoice capable….but not on T-Mobile in the US. Even after all the carriers offer HDVoice to their customers where things falter is passing calls between carriers. At present they do not pass wideband audio streams beyond their network edge. That means that the peering arrangements must be upgraded to allow HDVoice from Carrier X to be received by Carrier Y.